Fran Unsworth has been appointed the new BBC director of news and current affairs, replacing James Harding, who is leaving at the beginning of 2018. Unsworth is currently director of the BBC World Service Group and deputy director of news and current affairs. She started her BBC career in local radio, before moving to Newsbeat. She went on to become head of political programmes and then newsgathering. After four years at the BBC, Harding is setting up his own news media venture. 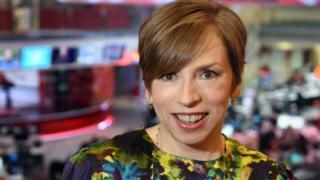 BBC director general Tony Hall described the role as "one of the most demanding of any in broadcasting", saying he was "delighted she is taking up the role". "She brings a combination of excellent news judgement, authority, management knowhow, and the trust of her colleagues both in news and across the BBC," he added. The job of director for news and current affairs, which has been accepted by Fran Unsworth, is undoubtedly one of the biggest in British, some would say international, journalism. It is also, by all accounts, an invitation to hell. Despite being one of the most powerful jobs in journalism, the job is not wholly, or even mainly, editorial. If you are in charge of a particular programme, or publication, the idea is that as editor you get to focus on the exciting business of editorial judgement: what stories, pictures, campaigns, headlines to use and so on. Unfortunately, the sorry financial state of much modern media means that editors' time is increasingly spent doing less fun things, like begging advertisers for money, or sacking people. At the BBC, however, there is a whole other world of pain, and rightly too: as an organisation owned by the public, every penny has to be accounted for, and most of the decision making too. Read the blog in full. Unsworth said she was "delighted", adding: "We are living through a period of significant change at home and abroad. In a complex world, the BBC's journalism matters more than ever. "I am proud to lead a team of such dedicated and talented people." Unsworth, who will sit on the BBC's executive committee, will take up the role at the start of the new year. In the past year she has overseen the biggest expansion of the World Service since the 1940s, adding 12 new global language services including Korean and Pidgin.